Oven temperature profiling on a regular basis can help ensure consistent product quality. Profiling enables users to optimize their process, improve process control, and make corrections whenever necesssary. The OM-CP-QUADTHERMOVAULT is a 4-channel, thermally insulated, battery-powered oven temperature recorder able to withstand extreme temperatures. It can withstand oven temperatures of up to 350°C (662°F) for 25 minutes. When properly sealed, its stainless steel enclosure and thermal properties make it the ideal temperature recording device for applications such as powder coating cure ovens, wet coating cure ovens, batch ovens, and conveyor ovens. 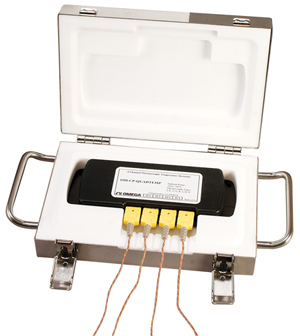 The external thermocouple probes provide accurate temperature measurements and fast response times. Our user-friendly software easily downloads the data to a computer, where the readings may be displayed in degrees Celsius, Fahrenheit, Kelvin, or Rankine. The software allows the user to view all data points and a summary of the data being viewed, for calculations such as mean kinetic temperature (MKT). If additional analysis is needed, the data can be exported to Excel simply by clicking a button. The OM-CP QUADTHERMOVAULT‘S small size allows it to fit almost anywhere. Data retrieval is simple. Plug it into an available COM port and our easy-to-use software does the rest. Data can be printed in graphical or tabular format or it can be exported to a text or Microsoft Excel file. *Accuracy does not include errors due to thermocouple. Nota: Logger comes complete with 3.6V lithium battery and 4 type K thermocouples, (glass braid insulation, 2m length). Operator's manual and interface cable are included with the OM-CP-IFC200 software/cable package (required for data logger operation, sold separately).